Despite being one of the Top 10 (easy) players of all time, Kobe had a few down years. It happens to all of us, right? Ultimately, the 2015-2016 NBA season was Kobe’s last. The team was in shambles. He was wore down. Laker land was dark. On November 2, he told the media that he’s not the 92nd best player in the league, as reported by the yahoos over at ESPN. He is actually the 200th best player. To be fair, Kobe was 36 and fresh off serious injuries that would end the careers of 20-year-olds. It is funny how one of the all-time greats can criticize himself that deeply. 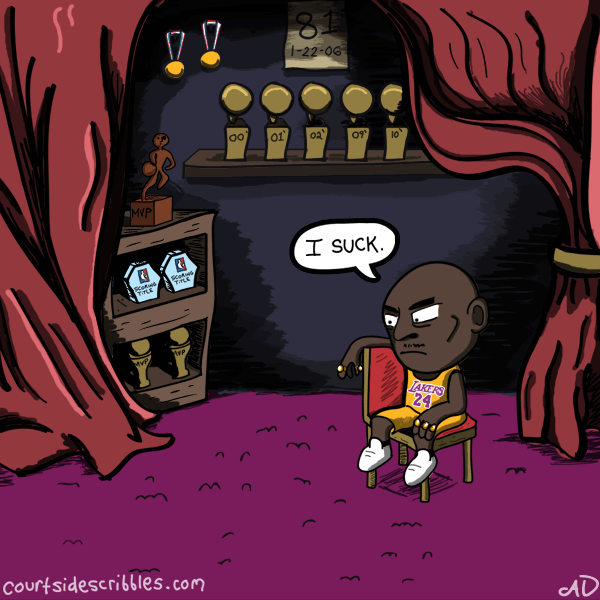 I imagined Kobe sitting in his trophy room, musing about his life and “staring destiny in the face” like Napoleon in Paul Delaroche’s painting.